The Blue Shield plaque is unveiled at the closing of the Blue Helmet Blue Shield Forum in Tyre on 5 April 2019. The Blue Helmet Blue Shield forum featured UNIFIL peacekeepers, LAF personnel, members of the municipality and the civil society. The five-day Blue Helmet Blue Shield forum included field visits to archeological ruins within UNIFIL’s area of operation. 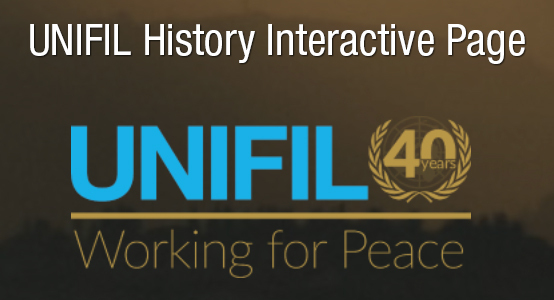 UNIFIL was selected as the location for the Blue Helmet Blue Shield forum as it is the only UN peacekeeping operation with UNESCO world heritage sites in its mission area. The Roman ruins, nestled by the sea in the south Lebanese city of Tyre, are breathtaking because they are so intact. The archeological structures are indicators of the habits and rituals of the people who lived here in the past, with the most noteworthy being the Roman baths, the two palaestrae, the arena and the Roman colonnade. Last week experts from the Blue Shield International, an international organization with the mission to protect the world's cultural heritage from conflicts and natural disasters, joined UNIFIL peacekeepers and UNESCO, at a five-day forum to discuss ways to preserve heritage in south Lebanon. Participants of the Blue Helmet Blue Shield forum listened intently as a historical specialist walked them around these ancient monuments. A series of workshops was held to raise the awareness of UNIFIL and the Lebanese Armed Forces (LAF) personnel of the importance of cultural property and why it should be safeguarded. Crucially the participants also included municipality staff and members of Tyre civil society to discuss how civil military cooperation (CIMIC) can enhance cultural property protection. “The workshops were unique,” said Mr. Karl von Habsburg, President of Blue Shield International. This was due to the presence not only of UNIFIL military peacekeepers and civil affairs personnel, but also LAF and the civil society. In 2017 the UN Security Council unanimously adopted resolution 2347, the first resolution to focus on cultural heritage and the importance of heritage protection for peace and security.